Ortmann, A.E. 1921. 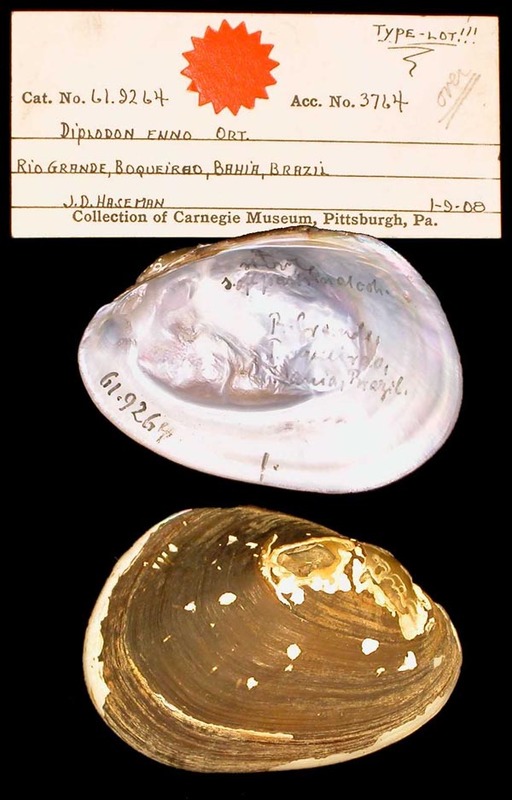 South American Naiades; a contribution to the knowledge of the freshwater mussels of South America. Memoirs of the Carnegie Museum 8: 451-670, pls. 34-48. 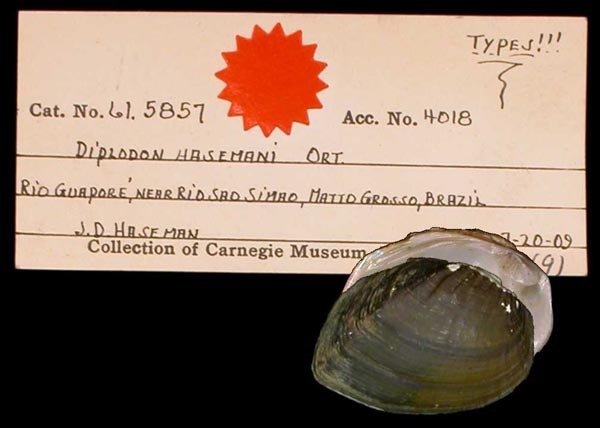 Anodontites (s.s.) hasemani Ortmann, 1921. Anodontites (s.s.) hyrioides Ortmann, 1921. Ortmann, 1921, Mem. Carnegie Mus. : 604, pl. 42, figs. 3-5. Type(s): LECTOTYPE CM_61.5229 (selected by R.I. Johnson, 1977), Rio Tapajós, Santarem, Pará, Brazil. Ortmann, 1921, Mem. Carnegie Mus. : 528, pl. 38, figs. 1-4; pl. 46, fig. 6. Type(s): LECTOTYPE CM_61.5865 (selected by R.I. Johnson, 1977), Rio Jacuhy, Cachoeira, Rio Grande do Sul, Brazil. Ortmann, 1921, Mem. Carnegie Mus. : 499, pl. 36, figs. 3-6; pl. 45, fig. 4; pl. 47, fig. 7; text fig. 4e. 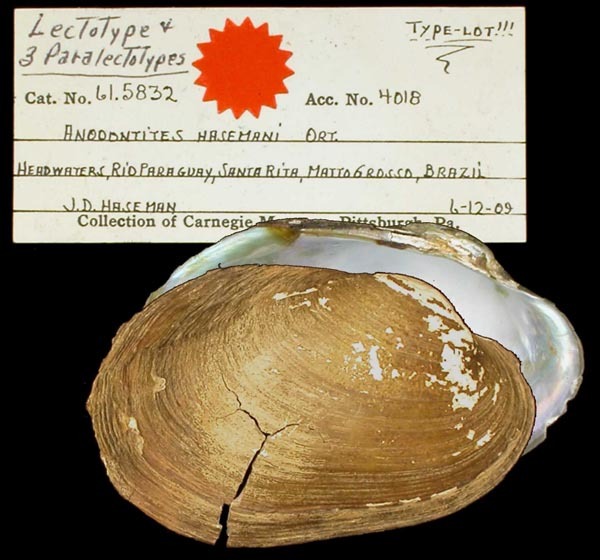 Type(s): LECTOTYPE CM_61.9253 (selected by R.I. Johnson, 1977), creek of Rio Iguassu, Serrinha, Parana, Brazil. Ortmann, 1921, Mem. Carnegie Mus. : 514, pl. 36, fig. 7; pl. 37, figs. 1-3; pl. 46, fig. 3; text fig. 4i. Type(s): LECTOTYPE CM_61.5864 (selected by R.I. Johnson, 1977), Rio Jacuhy, Cachoeira, Rio Grande do Sul, Brazil. Ortmann, 1921, Mem. Carnegie Mus. : 495, pl. 35, figs. 3-6; pl. 45, fig. 2; text fig. 4c. 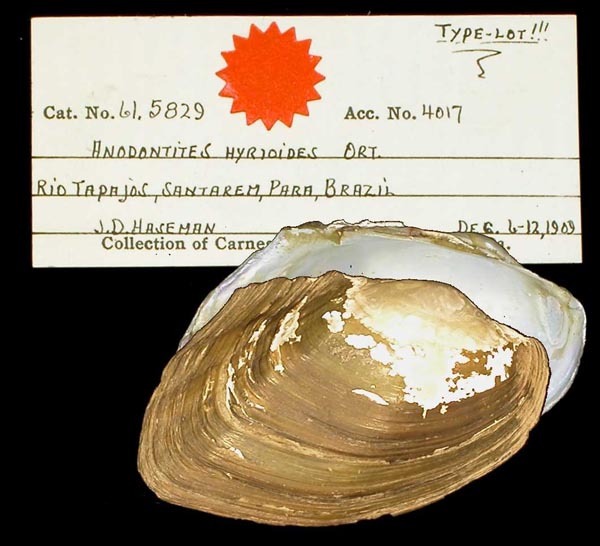 Type(s): LECTOTYPE CM_61.9250 (selected by R.I. Johnson, 1977), Rio Nhundiaquara, Morretes, Paraná, Brazil. Ortmann, 1921, Mem. Carnegie Mus. : 497, pl. 35, figs. 7-8; pl. 36, figs. 1-2; pl. 45, fig. 3; text fig. 4d. 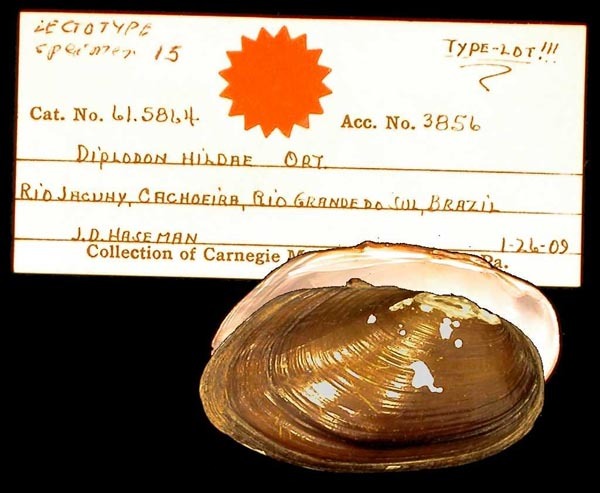 Type(s): LECTOTYPE CM_61.9251 (selected by R.I. Johnson, 1977), creek Aqua Quente, 8 miles W of Iporanga, Sao Paulo, Brazil. Diplodon (s.s.) hasemani Ortmann, 1921. Ortmann, 1921, Mem. Carnegie Mus. : 478, pl. 34, figs. 1-4; pl. 47, fig. 5; text fig. 4a. 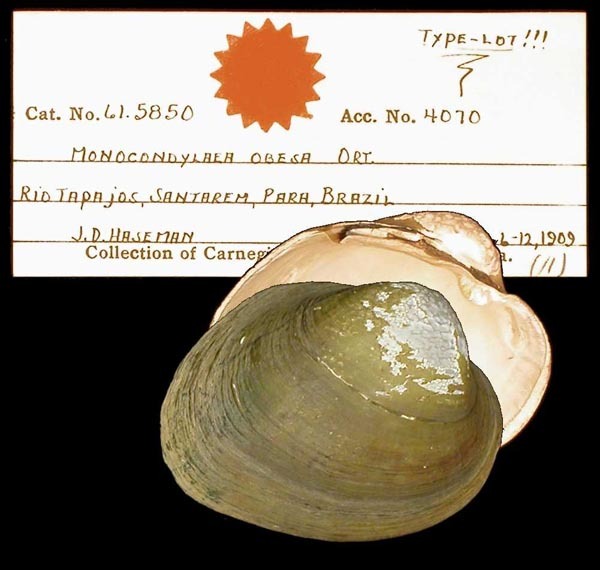 Type(s): LECTOTYPE CM_61.5857 (selected by R.I. Johnson, 1977), Rio Guaporé, near Rio Sao Simao, Matto Grosso, Brazil. 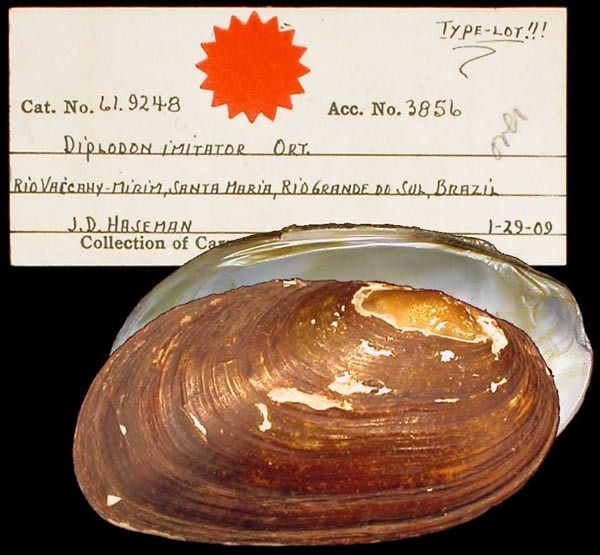 Diplodon (s.s.) imitator Ortmann, 1921. Ortmann, 1921, Mem. Carnegie Mus. : 491, pl. 34. figs. 5-7; pl. 35, figs. 1-2; pl. 45, fig. 1; pl. 47, fig. 6; text fig. 4b. Type(s): LECTOTYPE CM_61.9248 (selected by R.I. Johnson, 1977), Rio Vaccacahy-Mirim, Santa Maria, Rio Grande do Sul, Brazil. Diplodon (s.s.) mogymirim Ortmann, 1921. Ortmann, 1921, Mem. Carnegie Mus. : 520, pl. 37, figs. 4-7; pl. 46, fig. 5; pl. 48, fig. 2; text fig. 4k. Type(s): LECTOTYPE CM_61.9260 (selected by R.I. Johnson, 1977), Creek near Mogy Mirim, Sao Paulo, Brazil, tributary to Rio Mogy Guassú and Rio Grande, upper Paraná drainage. Ortmann, 1921, Mem. Carnegie Mus. : 585, pl. 41,fig. 1. Type(s): HOLOTYPE (ORIG. DESIG.) CM_61.5846, Rio Guaporé, near Rio Sao Simao, Matto Grosso, Brazil. Ortmann, 1921, Mem. Carnegie Mus. : 583, pl. 40, figs. 4-6. Type(s): LECTOTYPE CM_61.5850 (selected by R.I. Johnson, 1977), Rio Tapajós, Santarem, Pará, Brazil. Anodontites (Lamproscapha) ensiformis (Spix, 1827). — Ortmann (1921: 630). 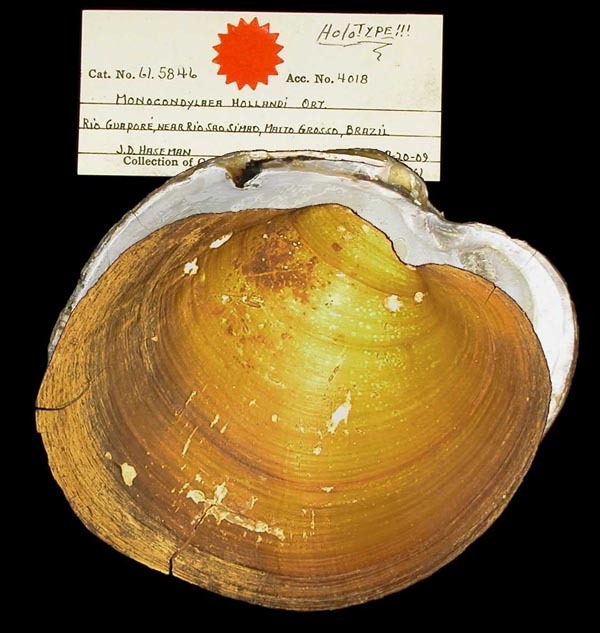 Anodontites (s.s.) clessini (Fischer, 1890). — Ortmann (1921: 594). 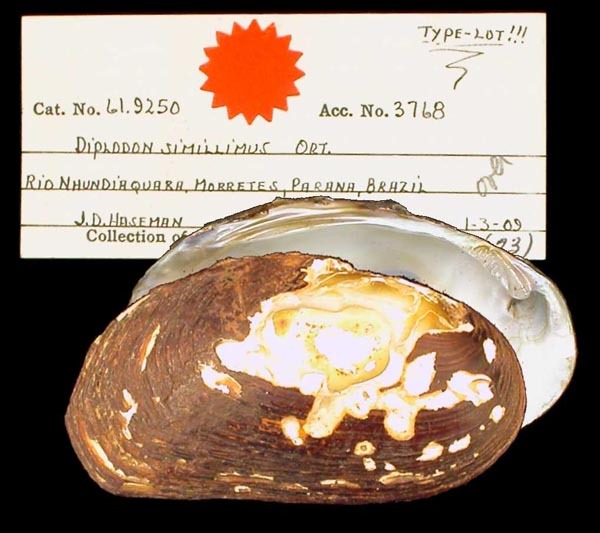 Anodontites (s.s.) crispata Bruguiere, 1972. — Ortmann (1921: 589). Anodontites (s.s.) forbesiana (Lea, 1860). — Ortmann (1921: 627). Anodontites (s.s.) hasemani Ortmann, 1921. — Ortmann (1921: 609). Anodontites (s.s.) hyrioides Ortmann, 1921. — Ortmann (1921: 604). Anodontites (s.s.) iheringi (Clessin, 1882). — Ortmann (1921: 620). Anodontites (s.s.) moricandii (Lea, 1860). — Ortmann (1921: 623). Anodontites (s.s.) mortoniana (Lea, 1834). — Ortmann (1921: 606). Anodontites (s.s.) obtusa (Spix, 1827). — Ortmann (1921: 596). Anodontites (s.s.) patagonica (Lamarck, 1819). — Ortmann (1921: 611). Anodontites (s.s.) patagonica rubicunda (Lea, 1860). — Ortmann (1921: 616). Anodontites (s.s.) puelchana (d’Orbigny, 1835). — Ortmann (1921: 619). Anodontites (s.s.) riograndensis (von Ihering, 1890). — Ortmann (1921: 624). Anodontites (s.s.) rioplatensis (Sowerby, 1870). — Ortmann (1921: 629). Anodontites (s.s.) tenebricosa (Lea, 1834). — Ortmann (1921: 592). Anodontites (s.s.) trapesialis anserina (Spix, 1827). — Ortmann (1921: 622). Anodontites (s.s.) trapesialis scripta (Sowerby, 1867). — Ortmann (1921: 622). Anodontites (s.s.) trapezea (Spix, 1827). — Ortmann (1921: 598). Anodontites (s.s.) trigona (Spix, 1827). — Ortmann (1921: 601). Castalia acuticosta Húpe, 1857. — Ortmann (1921: 554). Castalia baro (von Ihering, 1910). — Ortmann (1921: 557). Castalia hanleyana Sowerby, 1867. — Ortmann (1921: 556). Castalia inflata d’Orbigny, 1835. — Ortmann (1921: 558). Castalia pectinata (Spix, 1827). — Ortmann (1921: 557). Castalia undosa von Martens, 1885. — Ortmann (1921: 559). Castalina martensi von Ihering, 1891. — Ortmann (1921: 551). Castalina nehringi von Ihering, 1891. — Ortmann (1921: 548). Castalina psammoica (d’Orbigny, 1835). — Ortmann (1921: 551). Diplodon (Cyclomya) paranensis (Lea, 1834). — Ortmann (1921: 542). Diplodon (s.s.) berthae Ortmann, 1921. — Ortmann (1921: 528). Diplodon (s.s.) burroughianus (Lea, 1834). — Ortmann (1921: 517). Diplodon (s.s.) charruanus (d’Orbigny, 1835). — Ortmann (1921: 506). Diplodon (s.s.) deceptus Simpson, 1914. — Ortmann (1921: 539). Diplodon (s.s.) decipiens Ortmann, 1921. — Ortmann (1921: 499). Diplodon (s.s.) ellipticus (Spix, 1827). — Ortmann (1921: 526). Diplodon (s.s.) enno Ortmann, 1921. — Ortmann (1921: 531). Diplodon (s.s.) frenzelii (von Ihering, 1893). — Ortmann (1921: 488). Diplodon (s.s.) granosus (Bruguiere, 1972). — Ortmann (1921: 485). Diplodon (s.s.) gratus (Lea, 1860). — Ortmann (1921: 534). Diplodon (s.s.) guaranianus (d’Orbigny, 1835). — Ortmann (1921: 476). Diplodon (s.s.) hasemani Ortmann, 1921. — Ortmann (1921: 478). Diplodon (s.s.) hildae Ortmann, 1921. — Ortmann (1921: 514). Diplodon (s.s.) hylaeus (d’Orbigny, 1835). — Ortmann (1921: 473). 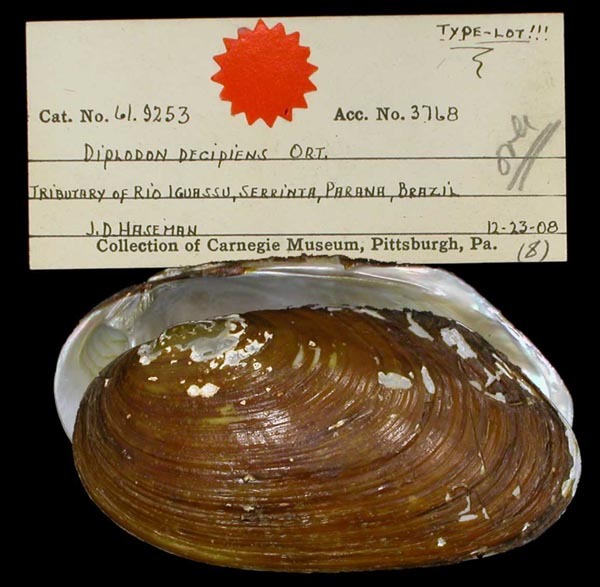 Diplodon (s.s.) imitator Ortmann, 1921. — Ortmann (1921: 491). Diplodon (s.s.) lacteolus (Lea, 1834). — Ortmann (1921: 518). Diplodon (s.s.) mogymirim Ortmann, 1921. — Ortmann (1921: 520). Diplodon (s.s.) parallelopipedon (Lea, 1834). — Ortmann (1921: 504). Diplodon (s.s.) patagonicus (d’Orbigny, 1835). — Ortmann (1921: 488). Diplodon (s.s.) paulista (von Ihering, 1893). — Ortmann (1921: 501). Diplodon (s.s.) piceus (Lea, 1860). — Ortmann (1921: 510). Diplodon (s.s.) rotundus Spix, 1827. — Ortmann (1921: 541). Diplodon (s.s.) simillimus Ortmann, 1921. — Ortmann (1921: 495). Diplodon (s.s.) suavidicus (Lea, 1856). — Ortmann (1921: 524). Diplodon (s.s.) trifidus (Lea, 1860). — Ortmann (1921: 480). Diplodon (s.s.) uruguayensis (Lea, 1860). — Ortmann (1921: 512). Diplodon (s.s.) vicarius Ortmann, 1921. — Ortmann (1921: 497). Fossula fossiculifera (d’Orbigny, 1835). — Ortmann (1921: 571). Hyria corrugata Lamarck, 1819. — Ortmann (1921: 561). Iheringella balzani (von Ihering, 1893). — Ortmann (1921: 569). Leila castelnaudi (Hupé, 1857). — Ortmann (1921: 638). 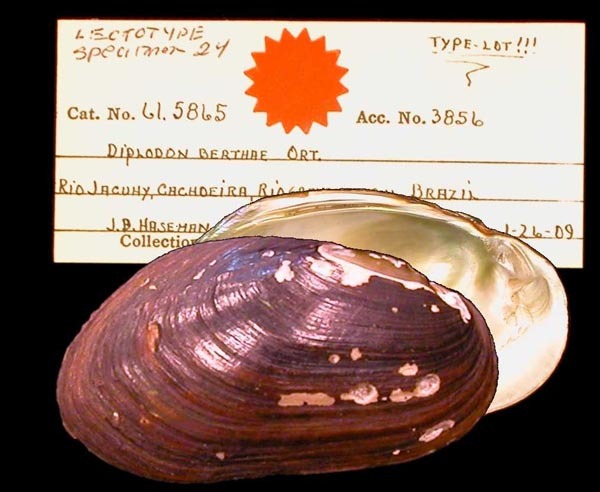 Monocondylaea hollandi Ortmann, 1921. — Ortmann (1921: 585). Monocondylaea lentiformis Lea, 1866. — Ortmann (1921: 573). 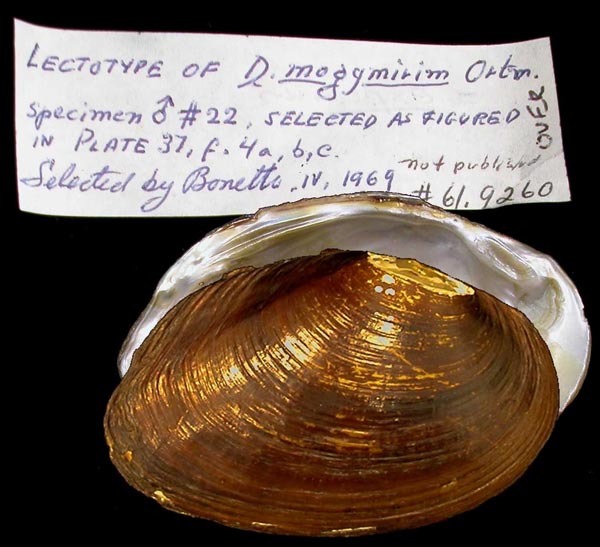 Monocondylaea minuana d’Orbigny, 1835. — Ortmann (1921: 579). Monocondylaea minuana parchappii d’Orbigny, 1835. — Ortmann (1921: 582). 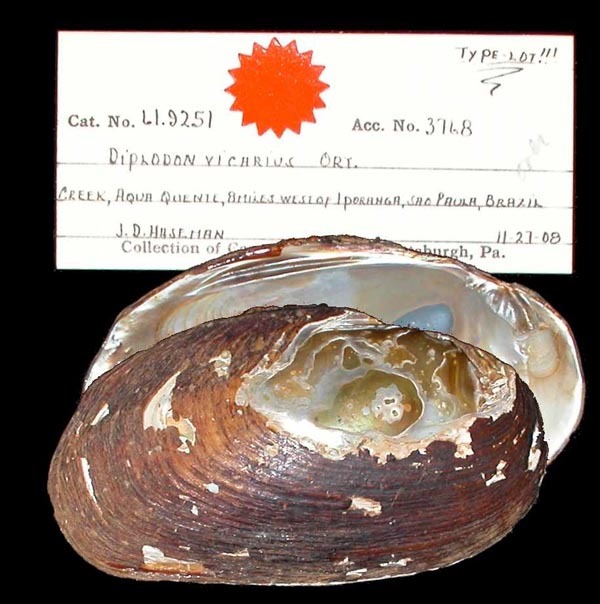 Monocondylaea obesa Ortmann, 1921. — Ortmann (1921: 583). Monocondylaea paraguayana d’Orbigny, 1835. — Ortmann (1921: 577). Mycetopoda siliquosa (Spix, 1827). — Ortmann (1921: 633). Mycetopoda staudingeri (von Ihering, 1890). — Ortmann (1921: 635). Mycetopoda subsinuata (Sowerby, 1868). — Ortmann (1921: 635). Prisodon alatus (Sowerby, 1869). — Ortmann (1921: 561). Prisodon castelnaudi (Húpe, 1857). — Ortmann (1921: 565).